uCoz Review 2019: Is uCoz a Good Hosting? With more than a million-and-a-half websites created all around the world using their website builders, uCoz is a leading provider of content management systems. Moscow-based uCoz operates from many offices across the country in Russia. It offers free website hosting built around its own content management system (CMS) that houses more than a million-and-a-half websites. While particularly popular in its own country, this popularity extends around the globe with versions also available in English, Spanish, German, Arabic, Hebrew, and many other languages. The main feature of uCoz is its website builder that addresses three different requirements: personal blog, business, and landing page. You can start working on your website immediately thanks to the easy signup process and the drag-and-drop user interface. While you do not need any programming knowledge whatsoever to create your website, you still have full control over the code in case you ever decide to hire a developer to further develop the website. 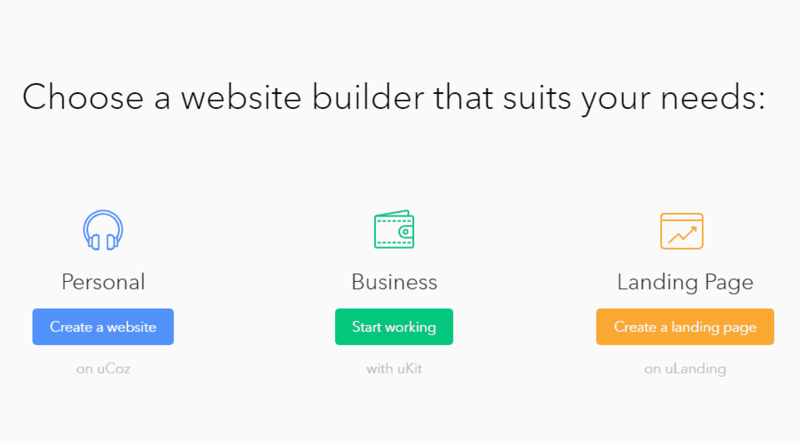 To build a website for your business using the ‘uKit’ website builder, you just need to tweak one of the readymade templates to suit your needs. If you also want to start selling online, you can use the ‘uShop’ tool that offers a variety of features to put your products online and receive payments from purchasers. The ‘uLanding’ tool is pretty similar but better suited to landing pages. It allows you to launch A/B tests, get traffic, and monitor results easily. In terms of additional features, you can opt for a higher level of antivirus protection and choose between different backup options on different schedules. All the plans that allow a custom domain also offer an SEO module, which you can use to optimize your website for search engines even if you don’t have any special technical knowledge. uCoz offers a free package for anyone who wants to take them for a test drive. I’m almost as confident as uCoz themselves that once you try… you’ll want to buy. Their website builder is that easy to use! Five further packages are available, with only the highest three allowing you to use your own custom domain name. You can register the domain for free if you pay for a certain period of time up-front, ranging from 6 months to 12 months. Similarly, only these three packages allow mobile-optimized websites and access to SEO modules. The packages offer adequate storage, but not unlimited, and are priced at what you would pay a good hosting company only for the hosting. So in one sense, you’re getting a powerful CMS for free. One disappointing aspect of uCoz is their customer support, which can only be accessed via an online contact form. Their Twitter and Facebook feeds are only updated once a month on average, which is always a red flag for me. uCoz could be a perfect fit for anyone who wants to easily create a website without handing out large sums of money to website developers. The monthly payment for their website builder is quite reasonable and is about the same as you would pay for a hosting-only account from someone else. In fact, you can’t get a hosting-only account from this company. Wondering how uCoz stacks up against other Web Hosting companies? Enter any other Web Hosting company and we will give you a side-by-side comparison.